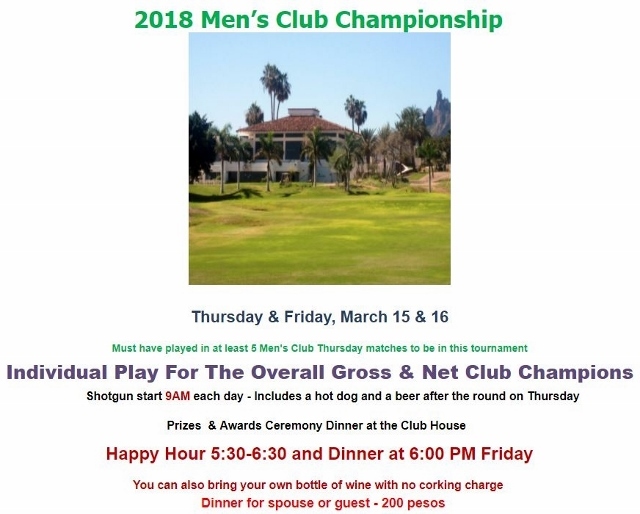 The 2018 Golf Club Championship takes place on Thursday, March 14 and Friday, March 15 with a shotgun start at 9:00am each day. You must have played in at least 5 Men’s Club Thursday matches to be in this tournament. There will be hot dogs and beer after the round on Thursday. The Prizes and Awards Ceremony Dinner will be at the Club House on Friday with happy hour from 5:30pm to 6:30pm, and dinner at 6:00pm. There will be 2 menu options: surf n’ turf or chicken cordon bleu. You can also bring your own bottle of wine with no corking charge. 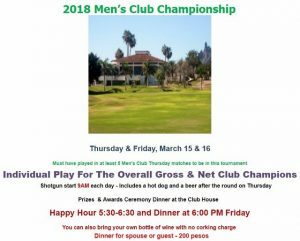 Dinner for golfer, spouse or guest is 200 pesos. For more information, visit sancarlosmensclub.com.